When creating a billing event, you may receive a billing error. Billing errors can arise for many reasons, including incomplete billing information, missing billing information and incomplete approvals. 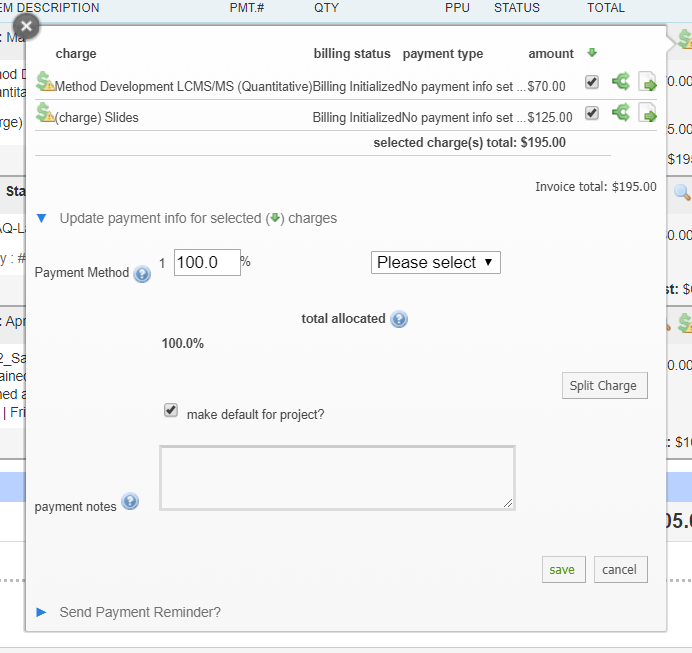 When you create a billing event, the status will display as "Billing errors" if errors are present. To view the specific errors, click on the "Summary" link. If there are billing errors that need to be resolved, a Billing Errors tab will display with a red number indicating the amount of errors in the billing event. Click on the Billing Errors tab to view the errors. The screen will now display a row for each error, with an explanation of the error at the top of each section. You may open the invoice in two ways: by clicking on the invoice number in the first column, or by clicking on the "View Invoice" link. The invoice will open in a new window. The red arrow indicates where the invoice needs to be updated. In this example, the yellow warning sign over the dollar icon indicates missing/invalid payment information. Click on the dollar sign to display the payment window, select a payment method from the drop-down box and click "save". The payment information is now updated and the billing error should be resolved. When back on the billing errors tab, you can refresh or revalidate to update the billing errors tab. Reach out to the iLab support team if you see any other error that needs to be resolved. Once you have cleared your errors, return to the Billing Errors tab. Click the "Revalidate" button to re-validate the invoice and clear the error. You may also refresh the screen to update and clear the error. If the error has been cleared, the Billing Errors tab will no longer display.